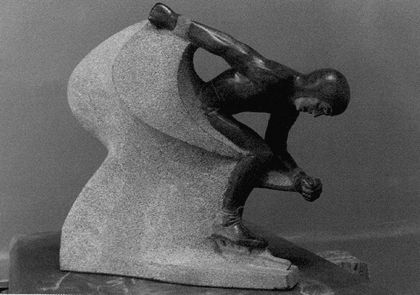 "Speedskater" depicting Jack Shea at moment of winning 1500 m race during 1932 Olympics at Lake Placid, NY. Pennsylvania "Gem Mist" granite, 2'-0" tall, 1979. Contrast is due to surface honing and tooling.